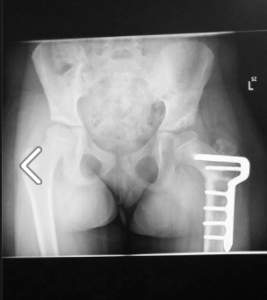 Also known as developmental dysplasia of the hip (DDH) and 'clicky hips', this is a common condition that health professionals aim to diagnose early in babies. It can result in months — and in some cases years — of medical treatment. 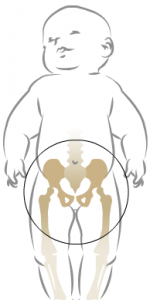 Left undiagnosed, it’s one of the leading causes of early-onset arthritis of the hip. Despite this, awareness of DDH and support for people impacted by it in Australia is limited. The mission for Healthy Hips Australia is to change this. Your support by spreading the word is greatly appreciated as are donations to further our awareness, support and education services. All donations over $2 are tax deductible. Donate now. 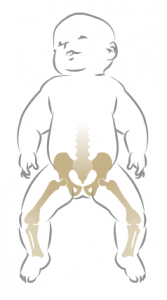 Who's more susceptible to hip dysplasia? Hip dysplasia is difficult to detect. Early diagnosis yields the most favourable outcome. It is referred to as a silent condition; there may be no obvious signs or symptoms. 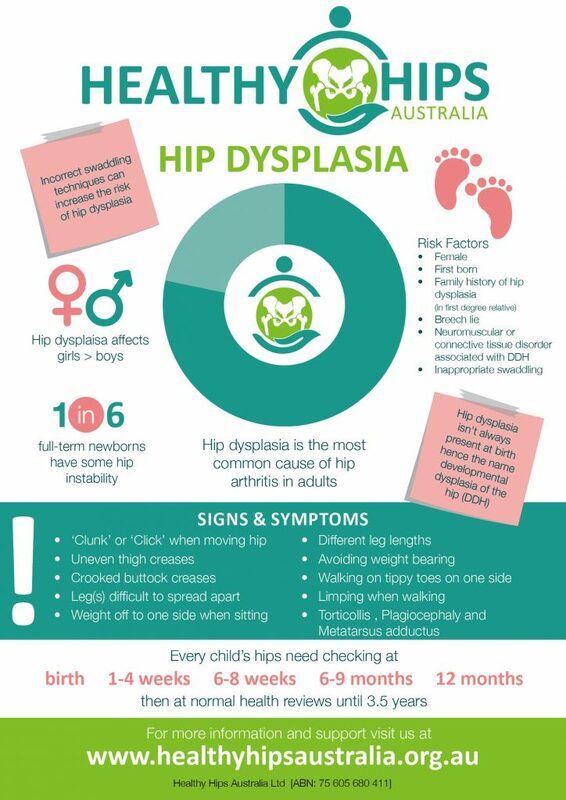 The following flyer lists some potential indicators of developmental dysplasia of the hip (DDH), the most commonly used term for hip dysplasia in children, to look out for. Please note the presence of these does not mean your child has DDH. Further evaluation with your GP or a child/maternal health nurse is recommended. There are many benefits to swaddling during the first months of life; it provides security and comfort, aides in settling and establishing sleep patterns. Research indicates swaddling can increase the risk for developmental dysplasia of the hip (DDH). See our Safe Swaddling Guidelines for further information. Follow SIDS and Kids guidelines – links below. If you feel passionate about increasing awareness for hip dysplasia please consider helping us in our work. Donate now. Please help us to raise awareness and support so those faced with a diagnosis are less overwhelmed- donate today. Written: December 2015. Latest revision April 2017.